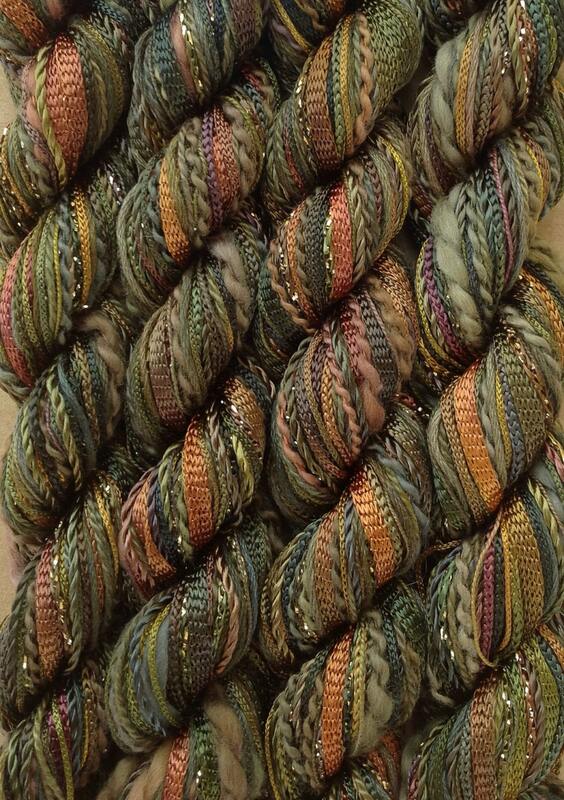 A gorgeous selection of cotton and viscose threads in various textures and thicknesses in one skein. The skein contains 10 different threads measuring 4m (4.37yds) each - 40m (43.68 yards) in total. 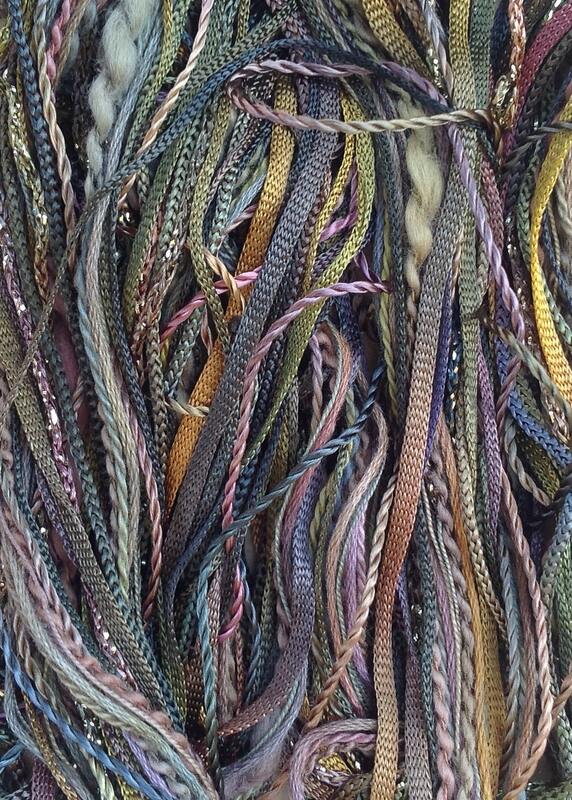 These threads have all been dyed together and are variegated in colour along their length. Colour No. 15 Sludgy Green - the overall colour appearance is dark green, but contains many subtle tones of different greens and browns with many subtle tones in between. FINE COTTON - An Egyptian Cotton Thread,16 weight/2ply, non-divisible, combed and mercerised. This thread has a beautiful sheen and is lovely to work with. One strand of this thread is equivalent to two stands of a 6 stranded cotton. MEDIUM COTTON - A 6 weight/2ply cotton thread, non-divisible, combed and mercerised. Equivalent to Perle 8 cotton it is a beautiful thread for all kinds of embroidery especially in conjunction with the Fine Cotton for Hardanger Embroidery and Sashiko Quilting. 6 STRANDED COTTON - A six strand 32 weight thread that can be used in any combination of 1 to 6 threads. Combed and mercerised. Beautiful for all forms of stitching, especially cross stitch and canvaswork. COTTON SLUB - A slightly slubbed yarn, 2.5 NM weight (roughly equivalent to double knitting yarn) useful for stitching texture or couching onto the surface of your embroidery. 6/167 VISCOSE CHAINETTE - A knitted viscose thread approximately 3mm in width. It is wonderful for stitching, especially canvaswork (needlepoint) and tassel making. 4/167 VISCOSE CHAINETTE - A knitted viscose thread approximately 2mm in width. It is beautiful for stitching, especially canvaswork (needlepoint) and tassel making. 3/660 VISCOSE CHAINETTE - A knitted viscose thread knit on 3 needles with a thicker rayon filament than the previous 3 threads. As a consequence the thread is thicker and rounded - more like a cord. 3600/2 VISCOSE CORD - A thin cord like 2ply viscose thread. Wonderful for stitching, especially canvaswork (needlepoint) and tassel making. 80/20 SPARKLE CHAINETTE - A knitted viscose chainette similar in weight to the 4/167 viscose chainette - knit on 4 needles but with a lurex thread running through it. As a general rule warm colours have a gold lurex thread and cold colours have a silver lurex thread. Use all of these threads for embroidery, particularly canvas work, mixed media, tassels, cord making, braids, scrapbooking, card making etc. etc. "One Offs" are one of our longest standing products. 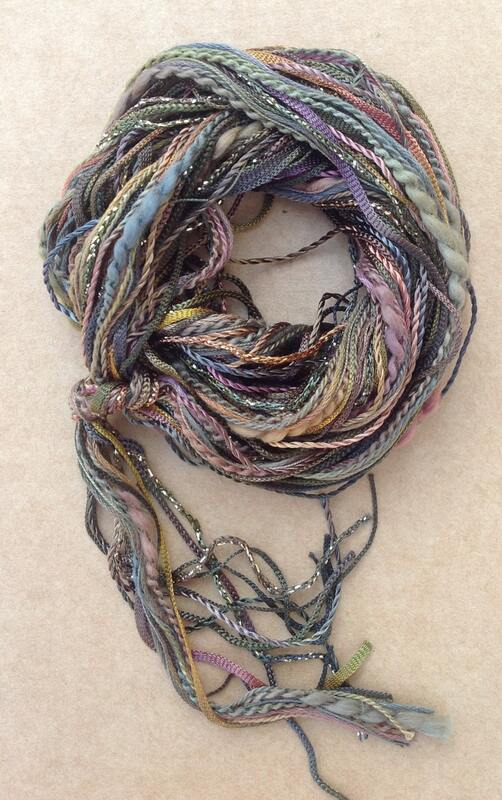 We have been dyeing this variety thread skein for 21 years - it is currently available in 32 colourways. Follow the links to see other colours available.